You are awesome Susan—Yay bees! The City of Los Angeles Department of City Planning is in the process of preparing an ordinance to allow beekeeping on single-family zone lots, with a draft ordinance expected before City Planning Commission in the spring of 2015. This ordinance draft is in response to a City Council Motion directing our Department and Animal Services to report back on the feasibility of beekeeping in residential neighborhoods. Saturday, January 10, 2015 | 10:00 a.m.
SPECIAL WORKSHOP featuring SAM COMFORT! TOPIC: Future Zombee Apocalypse: Bee Prepared and Stick Together! What will beekeeping be like 25, 50, or 100 years from now? The bee world is changing quickly. So are the bees and their environment. Their lessons in survival are their most valuable gift. Like the bees, we beekeepers must look to diversity, cooperation, and adaptability for our resilience. 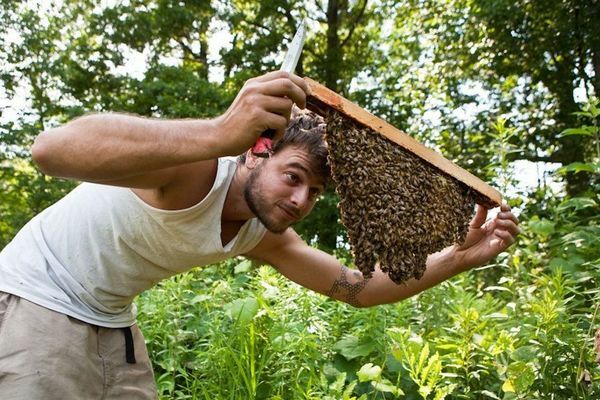 Anarchy Apiaries is around 500 hives of various types in all kinds of situations from New York to Florida. The more I bee the less I know. I’ll talk about our do-it-yourself methods, several hive designs, queen-raising, healthier, hardier bees with no treatments, and a future of a self-reliant beekeeping community with more hives than televisions. Have you ever wondered how our local, LA Urban beekeeping differ from other areas of the country? I just read the other day that beekeepers in Wales expect about 25 pounds of honey per year on their hives—33 pounds is a bumper crop! This does not seem like much. Our bees are active year ’round, making brood, honey and drones. This growth is very different from temperate climate bees and, as well, we are using Africanized hybrid ferals—a relatively rare population to survey. We now have a opportunity to participate in amassing data on our specific niche by the generosity of HoneyLove who purchased the SolutionBee Hive scale for me to monitor a hive in my backyard garden. Here in Australia I use these: https://apithor.com.au/index.html They do have a toxin, but it is sealed inside the housing that the bees chase the beetles into. Works extremely well, and very safe for the bees. I put grease patties on my hives two weeks ago using the recipe in the link below. I did not want to use alot of grease the first time since I did not know how it was going to work. On my big hive (one deep and 3 medium supers) it has killed at least 100 small hive beetles in two weeks. They drop to the IMP board, and I just toss them out. Apparently they need to lay eggs or pupate in the dirt to complete the life cycle. Put something under the hive and spread some diatomaceous earth to interrupt that cycle. Mine is on a concrete pad. Another recent pest that were first identified in the US in 1996 and in Nebraska in 2007, is the Small Hive Beetle (Aethina tumida Murray). Sometimes abbreviated SHB. The damage they do is similar to the wax moths but more extensive and they are harder to control. If you smell fermentation in the hive and find masses of crawling, spiky looking larvae in combs you may have SHB. The only chemical controls approved for use are traps made with CheckMite and ground drenches to kill the pupae, which pupate in the ground outside the hive. While I have seen a few, I have not had any issues with these, but I will probably go to more PermaComb in the brood nests if they ever become too much of a problem. Strong hives seem to be the best protection.